The US Dept of Agriculture - Forestry Service, has tested Termidor for more than 8 years. So far, results show 100% effective termite barrier protection. The best alternative and main competitor in the marketplace is Premise termiticide, owned by Bayer Environmental Science. Termidor has received consistent praise from pest controllers as providing (1) a long-term reliable and effective soil barrier to protect buildings from subterranean termite infestation, and (2) a remarkable capacity to adhere to the worker termites skin and be transferred back to eradicate termites en masse, in their central colony nest. It seems clear cut that Termidor is one of the most technologically advanced termiticides, commercially available. What's more, it has an excellent safety and environmental profile, provided it is used to regulatory requirements. Termidor is applied by licensed pest controllers to soil areas abutting a building in order to eradicate termites as they attempt to gain entry into the building. This provides immediate protection and reduction of risk of on-going expensive structural timber damage from a termite infestation, of a kind not available from alternative termite baiting systems. In addition, termites in contact solely with a lower concentration area, such as, in the out-reaches of a Termidor treated soil area, will not detect it's debilitating effect until a few days later - enough time to routinely transfer the Termidor active ingredient to other termites they contact. This delayed accumulative lethal effect of Termidor, aimed at eliminating the entire colony, is discussed in detail later on. Termidor works quite differently from other termiticide soil treatment products which are repellents, in effect designed to repel or keep termites away from a treated soil area, rather than killing them. This means any minute gap in the treated soil can be detected and exploited by the termites to gain entry in the building. This is a major short-coming of the old-fashioned termite control alternatives, far too often, with financially disastrous consequences. This delayed lethal effect provides enough time for the Termidor chemical to be transferred back to the central colony nest to infect other termites. If you have termites in your property, we recommend you discuss the problem with the neighbors. Obviously, several homes close by each other with a Termidor treated soil barrier, will greatly increase the chances of successful termite colony elimination, for the benefit all concerned, excepting the termites. Based on our extensive testing, published results of field trials by regulatory authorities and the manufacturer and other industry feed-back it appears that for buildings under heavy termite infestation, a complete Termidor treated soil barrier thereto has a devastating effect on a termite colony within a few weeks. Termidor is more expensive than alternative products, so BEWARE of "dodgy" companies which undercut the required application rate in order to cut costs, which will NOT provide the level of protection neccessary. Refer to the CONSUMER ADVICE section later on, for tips on selecting a reliable pest controller. At law Termidor is to be applied at 0.06% concentration in water solution to soil areas abutting a building. Unlike some alternatives, Termidor is odorless and does not contain solvents or any other substances that may lead to indoor air contamination. For the environmentally conscious: Termidor will not harm soil micro-organisms, earthworms or plants. Nor will rainfall or irrigation cause it to leach through the soil. Caution should be exercised to ensure this product does not get into aquatic water systems. The active ingerdient of Termidor is fipronil, is classified by EPA as a CAUTION label product of low hazard to humans, dogs and cats. Before Termidor was made available for use in the USA it was subject to some of the toughest tests in history. For more than 8 years, so far, the USA Forest Service has tested the effectiveness of Termidor as a termite control soil barrier using the ground board and concrete slab protocol in four US states involving a variety of climate, soil types and environmental situations. Under heavy termite activity Termidor at every location, provided 100% effective termite protection. The "transfer effect" of Termidor has been observed through controlled scientific testing using C14 radio labeled fipronil on live termites. In brief, Termidor treated soil acts on an on-going basis to prevent termite entry through a treated soil area into a building or other protected structures. Such a chemical soil barrier under and around the external perimeter of a building is a pretty big target for the foraging termites to hit, rather than scattered bait stations around the building! 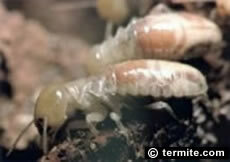 For information from BASF regarding its Termidor termite control product - click here. Based upon this inspection, the termite controller can recommend exactly where and how the Termidor soil barrier treatment should be applied. The main competition product Premise has similar attributes but is sold as the "lower cost effective alternative". Premise has been used for termite control for more than eight years and is well proven to offer highly effective termite protection. Where a complete Termidor soil barrier treatment is not practical or desired by the property owner - then we recommend the Exterra or Sentricon termite monitoring and baiting system also be installed. Ring the Experts: The success of a Termidor termite control soil treatment depends heavily upon the skill and experience of the termite control specialist engaged. Termidor is more expensive than the alternatives, so BEWARE of "dodgy" companies that under cut the required application rate in order to cut costs, which will lower the level of protection neccessary. Termidor and Premse is only available to licensed pest controllers.